This entry was posted in dog, Uncategorized and tagged chew, gumdrop on November 21, 2015 by maggie0019. Woof! Hello! It’s been kind of slow here news-wise. It’s been very cold, and I have been having problems going outside. Mom and Jamie are keeping a close eye on me though, and Laurel stopped by yesterday and we took a lovely walk until my back leg stiffened up on me. Erik stopped over and I just love to see him. He holds me on his lap like I’m a baby. I wrap my paws around his neck and smile and smile. I feel like a little poodle when he holds me! Maybe, I’m part “designer dog”. They just have to build a purse big enough to hold me. There is a basket by the hall tree that Mom tries to keep covered. But I have discovered the secret of sniffing inside and rooting out objects to steal away and chew. Shoes, scarves, gloves, all are fair game. However, I found something different in the pocket of a jacket that was tossed in the basket. It was Jamie’s old iPod Shuffle. I snatched it up and ran to my favorite spot on the landing. I’d seen Jamie with these thingies in his ears before, and I wasn’t sure how it worked. I could not push the button because of my long nails. So, I just chewed it. 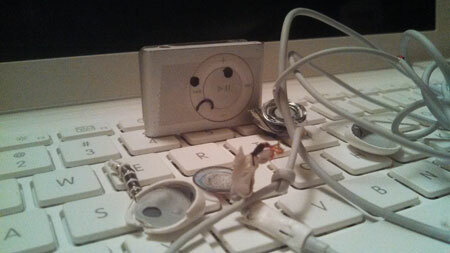 The iPod Shuffle wasn’t happy about this state of affairs, and the headphones even less. Jamie freaked out that maybe I swallowed a magnet, but a review of the remains showed no ingestion, just chewing. Hey, I love music! This entry was posted in Uncategorized and tagged chew, cold, dogs, headphones, iPod shuffle on January 14, 2015 by maggie0019. Just wanted to wish you all a safe and Happy Chew Year. The New Year holiday is the hardest for some people, and I’m sending you all a sloppy face lick and a mighty tail wag. May we all be healthy and 2015 favor us. This entry was posted in Uncategorized and tagged chew, dogs, happy new year on January 1, 2015 by maggie0019. When Jamie was a young pup, he used to love the Thomas The Tank Engine stories that Mom read to him out of a big book (by Rev. W. Awdry). One of the characters, the Controller of the Railway, was Sir Topham Hatt. Sir Topham Hatt kept things running smoothly and on time, and the best compliment he could pay his engines was that they were Really Useful Engines. The old series focused on manners, and doing the right thing because it was the right thing to do. Jamie was very influenced by this and is still one of the nicest, most polite young humans that I know. Fast forward nearly a decade, and Jamie has made his Confirmation and received some money. He decided to buy something special with it: a top hat. 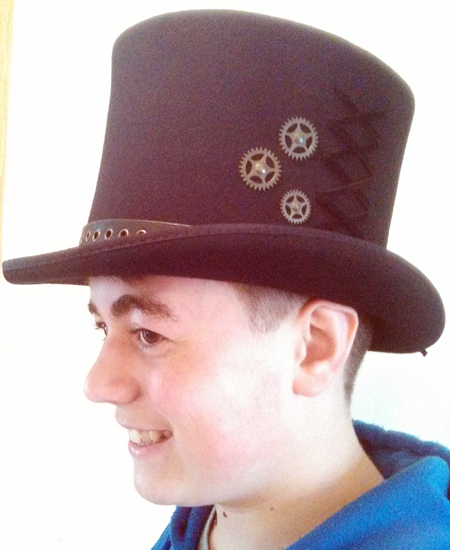 The hat is a wool felt, Steampunk top hat complete with gears, lacing, and a smooth, satiny lining. Jamie waited patiently for it to be delivered. He purchased the hat from Kenny K Hats through Amazon.com. Although I wish I could chew it up like I chewed up the duck, I know this is Jamie’s special personal property and I will respect it! 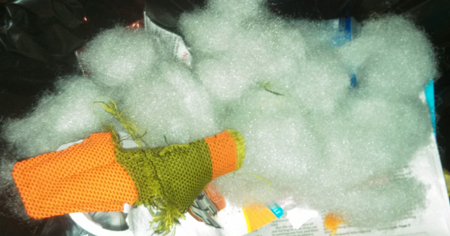 In fact, I’d say this duck was goosed! This entry was posted in Uncategorized and tagged chew, dog, duck, goose, Kenny K hats, Sir Topham Hatt, son, stories, Thomas the Tank Engine, top hat on April 18, 2014 by maggie0019. Today, Erik came over to do Mom’s hair, and, as usual, I was transported in joy. Erik is one of my very favorite humans, and he has such a good dog smell, too. I was jumping by leaps and bounds, and Mom and Erik were telling me, “Off!” (the command from Canine College). However, I did not want to “Off!” I wanted to be “On!” and acted accordingly. Mom had the training collar on me and the leash. They told us in school that if the dog is supervised, to keep (her) on the collar and leash, and let the dog drag it around the house. 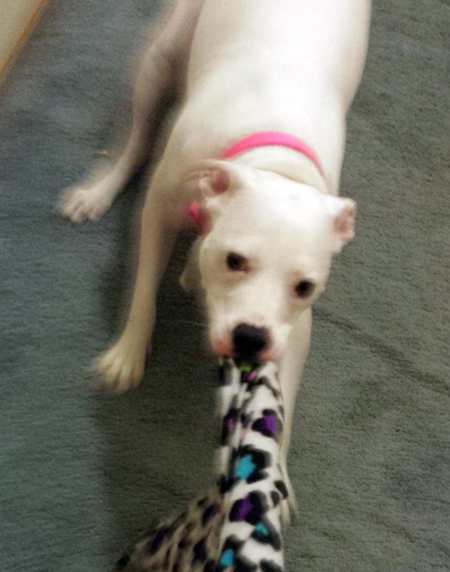 The idea is to be able to “correct” the dog’s misbehavior with a tug. So Mom has been following instructions, and I’ve been dragging the leash around. I got a bit put out with being told to, “Sit!” and “Off!” and the occasional tug when I was feeling so exuberant. 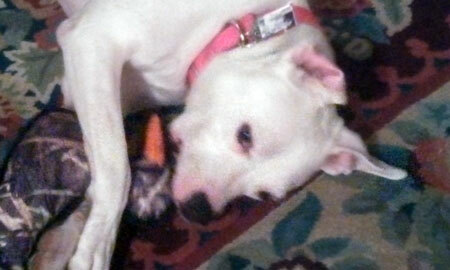 So, I sneaked up to the landing of the stairs as if I were taking a nap, hunkered down, and chewed the leash in half. 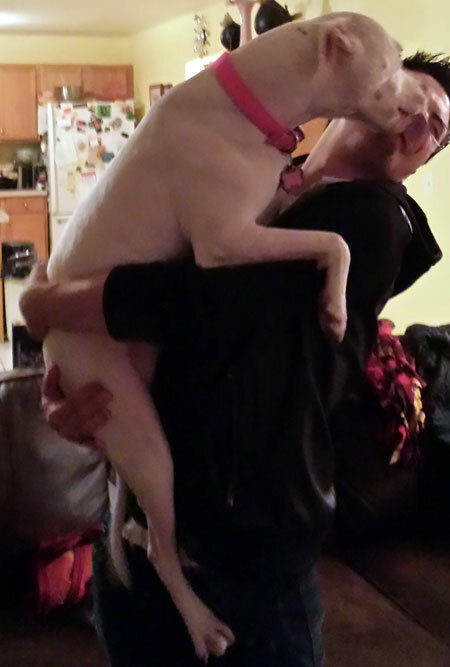 Then, triumphant, I came trotting downstairs, tail waving proudly, and jumped on Erik. Mom is VERY upset with me. 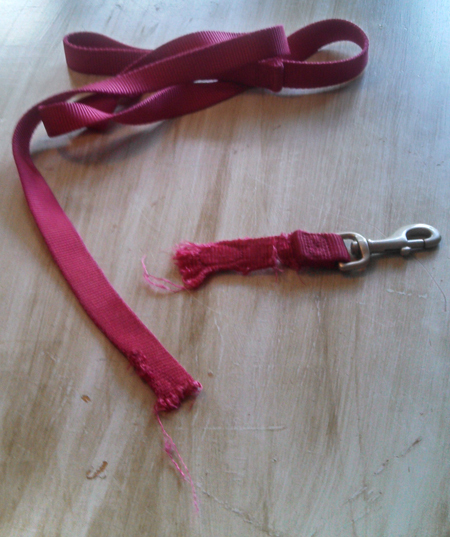 She says we can use the small leash from the animal shelter, but she has to buy a new one. Probably chain instead of fabric. This entry was posted in Uncategorized and tagged chew, dogs, family, happiness, joy, leash, sneaky, sons on August 6, 2013 by maggie0019. I think all this rain is making my people act a little silly. For one thing, they are laughing at everything, even if it’s not even funny. They must need to run around a little bit. Take the rake, for example. Mom had a small rake against the house. I decided to investigate and dragged it out. Then it was bigger than I thought, so I dropped it. Later on, I saw it again, and decided it was an intruder in the yard, and went into my “guard dog” stance, standing over it and barking and barking. Jamie and Mom watched from the window, and thought this was hilariously funny for absolutely no reason at all. Mom put the rake back against the house, but by then I’d figured out it was no big deal and dragged it out again a few minutes later. I dragged it around a while, until I heard them laughing, saying, “Look, she’s raking up the yard!” More laughter. I really didn’t see what was so funny about this, even if I did have the rake in my mouth by the handle. Really, I don’t see what’s so funny. I think the rain is making my people act as bad as the squirrels! This entry was posted in Uncategorized and tagged chew, funny, laughing, rain, rake, silly, tree branch on June 2, 2013 by maggie0019.